Who will work in medical line? Planets to opt for Medical Line - will i become a doctor Horoscope? Today we will focus on medical line as to who can be a Doctor who can go for para medical line in details. Also we will discuss whether MBBS ( Doctor ) BAMS ( Ayurvedacharya or Vaidya degree ) BHMS (Homeopath ) or BDS . Always remember, In medical line, We have to focus on 6th house because 6th house is a store house of diseases, patients, medicines and health sector. Now we will discuss the main conditions to go for medical line. First of all we will know something about Venus in context of medical line. Venus is Shukracharya in mythology and Shukracharya had got such a ‘MRIT SANJIVANY VIDYA’ that He was giving new lives to all the demons who were killed in battles. Venus gives best knowledge of medicines. He can create miracles. Venus represents Dhanvantari or Ashwinikumaras. 1. Venus must be connected with Ascendant or Ascendant lord. Or Ascendant lord should be in Taurus or Libra. If not then, Venus must be in 6th house or in 12th house aspects 6th house. Or 6th lord must be associated with Venus or in Taurus or Libra. So this way Venus connection with first or 6th house has maximum chance to become a successful Doctor if following conditions are also present in the chart. 2. Lord of 6th house should be either in 2nd hose (money), or in 10th house (profession or practice ) or in 11th (Income ) or in 8th house (aspects 2nd house) or in 12th house (aspects 6th house ). 3. Lord of 6th house is at 0 (zero) or 29 degree. This degree gives tremendous magnetic strength to the planet. 4. Lord of 6th house is either exalted or debilited in any house. If any one of the above conditions from 2 to 4 is satisfied then opt for medical line undoubtedly. Mars/Ketu has connection with fast result and thereby Alopathy and operations/surgery. Venus and Saturn has connection with Ayurveda. Venus is the planet of biology, various medical trees and plants, AUSHADHY and RAS VIDYA. Saturn prefers the old therapy with strong diet discipline. Rahu is the planet of miracles, works at minute, subtle or microscopic level so Homeopathy is best selection for strong Rahu in Ascendant or 6th or 10th or with lord of first or 6th. Dentistry is connected with 2nd house so if Ascendant lord or 6th lord is in 2nd and if 2nd house is strong then DENTAL line is preferable. One more thing I would like to mention here is that fees of MBBS line is very very high and all parents can not afford the expense in lakhs of rupees for full course of 5 years. Sometime student is very smart clever and ranker but due to bad transit or dasha at the time of 12th examination, percentage are below 80/85 so they have to opt for BDS or BAMS or BHMS or Physiotherapy . Also demands of Dental surgeons and Physiotherapists is much more in foreign countries so those students who wish to settle abroad prefer Dental or Physiotherapy. Mars if connected with Venus makes expert in Chemistry and Pharmaceuticals so if medical line is not possible due to percentage or heavy expense, then prefer B. Pharm degree. In next post we will discuss whether to go for Surgical branch or Non surgical branch. Whether to go for Clinical line or non clinical line. And also detailed analysis whether to go for Radiology, Pediatric, Skin , Ophthalmology, Gynaecology, Cardiology, Orthopedic, Neurology, Nephrology etc. 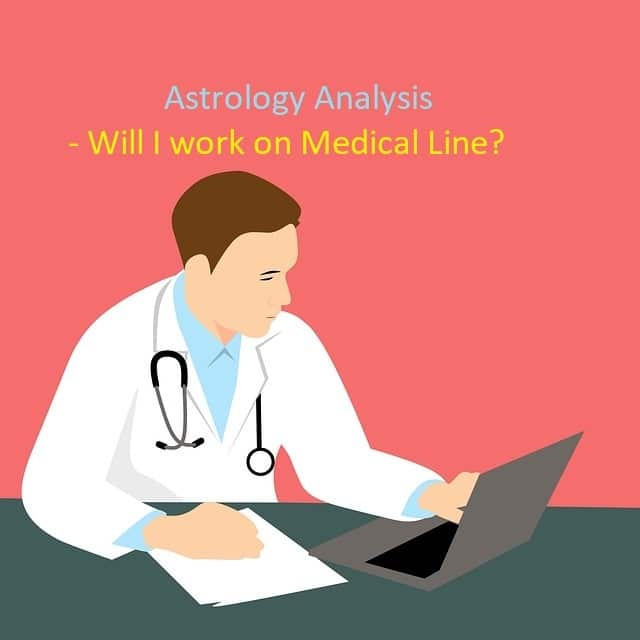 astrology analysis for medicalAstrology analysis for Medical Linebecome a successful Doctormedical field horoscopeWho will work in Medical Line?will i become a doctor?